Now that you’ve registered your account, it’s time to start exploring. 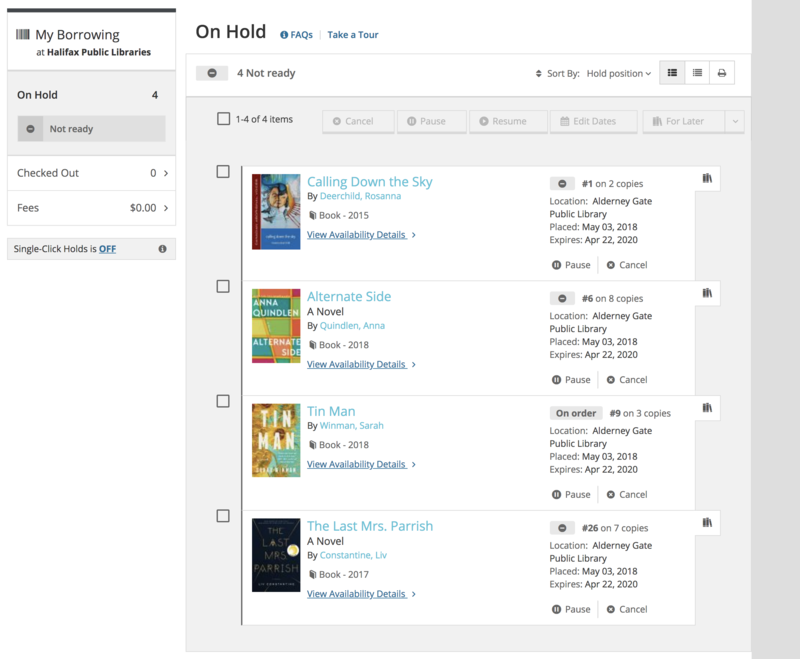 This post provides an overview of some of the options available to you in the MY BORROWING section of the My Library Dashboard (access it by clicking Login/My Account OR your username—if logged in—at the top right corner of our website). Once you're logged in, you can review information relating to your account. Here’s where you’ll find some of the most commonly used functions. TIP: Now that you've signed up on our new website, you may want to import your "wish lists" from our previous site (if you had any). Click the Request Import button as seen at the top in the image below, and your wish list from our previous catalogue will be loaded to the new site. This option is also available from your For Later shelf. We recommend it—you'll be able to enjoy all the benefits of Shelves! An example of an Overdue item flag in the Checked Out section of My Borrowing. Review what’s currently checked out on your account and when it is due back. Sort your checked out items by due date, format, title, and author using the Sort By drop-down menu at the top of your item list. Rate items using the star system (as detailed in our All About Making Lists and Reviewing post). TIP: You can now also keep track of any digital items you have checked out or have on hold through Libby or Overdrive directly through our website. Here's where you can view the status of the items you’ve placed on hold. Ready now: The item is available for pick up at your chosen location. Not ready: Shows where you are in the queue and how many copies of the item the Library owns. Paused: Displayed on items you have on hold for a future date (formerly known as “suspended” holds). Cancel holds you don’t want any more or Pause those which you’d prefer to borrow at a later date. 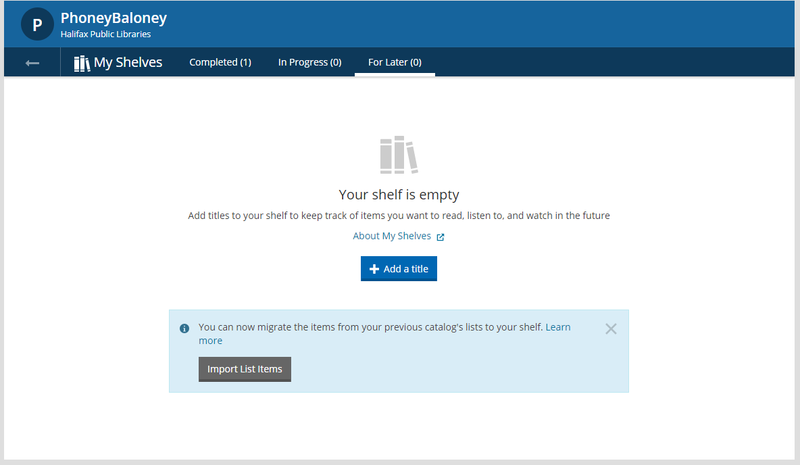 For Later: Add the item to your For Later (or In Progress/Complete) shelf directly from here. TIP: Not only does our site show you any cancelled or expired holds you may have, you can now place some of these items back on hold with the click of a button. These can be found at the bottom of any page of your On Hold list. Here, you can keep track of any fines which may be owing on your account. TIP: You can pay your fines directly through your account using your credit card via the Pay Now button. This section allows you to review any messages on your Library account, including cancelled or expired holds, and messages from Library staff relating to your account (e.g. if an Interlibrary Loan has arrived for you). TIP: By clicking on the title of the item noted in the expired/cancelled hold message—you can see the cover and status of the item and sometimes (dependent on loan type) place it on hold again if you’d still like it. Congrats! You’ve mastered Borrowing. Now it's time to find some items to borrow by searching for them in our catalogue. Learn All About Searching Our Catalogue in this helpful post.